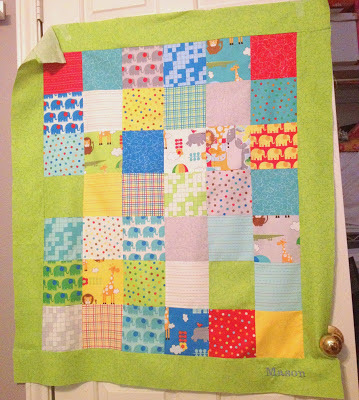 I am working on getting all my completed quilts posted on the blog and here is one of my favorites...my quick and easy go-to baby quilt. I decided to round the corners to add a little softness to the quilt since it's made of all squares...ya know? You could also add little ties on the back side so you can tie it to the car seat. Just make extra binding and sew it one the edges before you attach the quilt binding. I made this one for my sweet little relish #2 before she was born using fabrics from the Sassy collection from Moda. I can't believe I didn't take a finished photo of this quilt I made for a friend that was having a boy (palm to face). I guess I was so excited to get it packaged and shipped! These fabrics are from the Bungle Jungle collection from Moda. Speaking of little relish #2, she just woke up from nap so off to the store we go...Thanks for stopping by!